Selling limited-edition sneakers in augmented reality is the new wave. Nike hasn't been coy about how much it loves using augmented reality to sell hyped sneakers, since the technology can be used to fight the bots (automated systems) that are so beloved by resellers. And today, at the F8 developers conference, Facebook revealed a partnership with the sportswear giant that will let sneakerheads buy limited-edition pairs through the Messenger app... in AR. To show this feature off, Nike dropped a pair of Kyrie Irving signature shoes during the F8 opening keynote, which were dubbed the "Red Carpet" and sold out within minutes after the Facebook announcement. The process to get them was fairly simple: All you had to do was open up the Messenger app, chat with the SNKRS bot, enter a few basketball-related emojies and that unlocked the pair of Kyrie 4s for you. After that, a virtual render of the shoe popped up on your phone and you could move around to take a closer look at it before making the purchase. 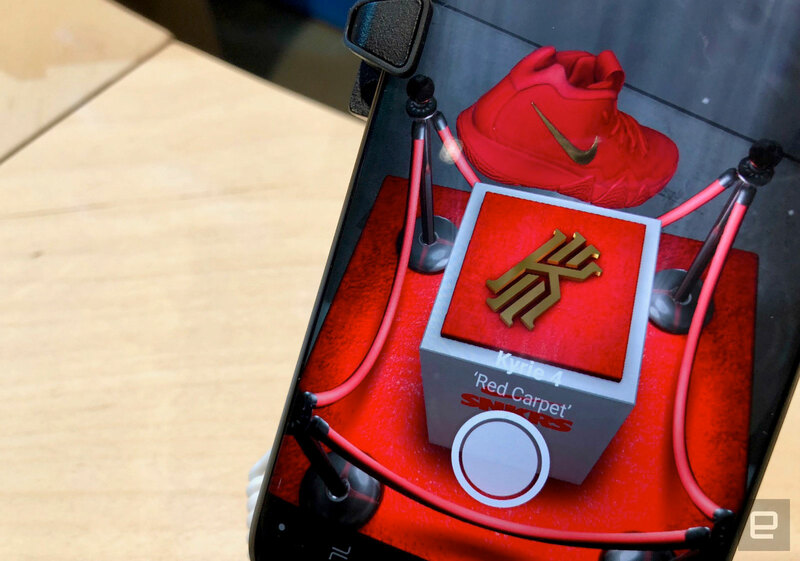 It's a great, futuristic retail experience that Nike began experimenting with last year, when it launched an AR feature within its SNKRS app for iOS that let users buy an exclusive pair of SB Dunks. For Facebook, the partnership with Nike is only small part of its ambitions to let brands use augmented reality in Messenger to sell their products. Aside from Nike, the company also announced ASUS, Kia and Sephora as early partners, and chances are many more will join in the coming months. For ASUS, meanwhile, I saw a demo where you can play with the ZenFone 5 in AR and tap on different hotspots of the phone (like the camera) to learn more about its features. The ZenFone 5 probably wouldn't sell as fast as those Kyrie 4s, but it was still fun to check out ASUS' phone in a more immersive way than a boring stock image could offer. We'll see what else Nike launches in AR on Messenger soon. But for now, you can bet hypebeasts who weren't using Facebook's app before are now going to be all over it waiting for the next, limited-edition sneaker drop.